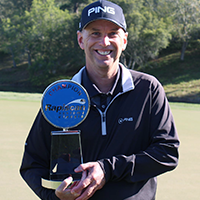 The team at Malcolm DeMille congratulates Kevin Sutherland on his playoff win at the PGA Tour Champions - Rapiscan Systems Classic. With a playoff round on Monday, Kevin Sutherland earned the Anthony Topazi Trophy created by the team at Malcolm DeMille. Malcolm DeMille worked closely with Rapiscan Systems Classic to create a finely crafted trophy featuring the tournament logo in a challenge coin format on the front and the verbiage, “In Appreciation of our Men and Women who Secure Protect and Defend” on the back. 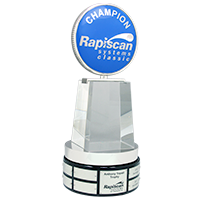 The Anthony Topazi Perpetual Trophy is hand cast in rhodium plated bronze, filled will blue high polished epoxy, and set atop a crystal pyramid and black acrylic base with the names of all Rapiscan Systems Classic Champions engraved on the base. The team at Malcolm DeMille is proud to create this unique prize for another PGA Tour Champions event!